Washington – Rep. Jahana Hayes, a former National Teacher of the Year, Wednesday had her first chance to question Education Secretary Betsy DeVos, resulting in a heated exchange over the use of federal money to arm teachers. Hayes retorted “No, I’m not going to let you do this,” and continued to press for an answer from the secretary – who had dodged dozens of questions from Democratic lawmakers during the hearing. 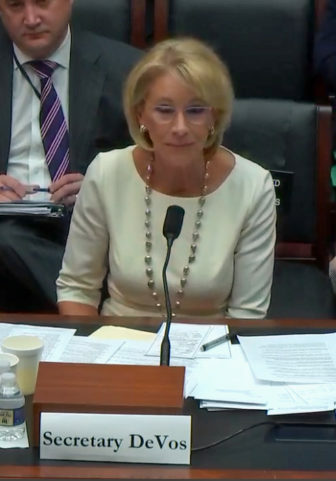 Education Secretary Betsy DeVos at the House Education and Labor Committee hearing.